Six years ago in May, with Cuban jazz spilling out into the relative stillness of midnight in Key West’s Mallory Square, my boyfriend, Craig, went down on one knee and in the teary, laughter-filled moments that followed became my fiancé. Pictures – the touching-but-terrible red-faced sort – were snapped. Passers-by applauded. My new ring sparkled like the stars overhead. Rum flowed. Copiously. The next morning, we began scratching an impromptu guest list on the back of a placemat. When we’d listed all the people, friends and family, we could possibly imagine inviting, the list totaled an imposing (drum roll, please….) 41. Hmmm. Larger than the 15 or so we’d imagined. We wanted something small and tropical. Maybe a sailboat wedding in the Keys followed by a dinner party. We went over the logistics. We lived in Miami, but basically all of our closest friends and family were back home in New York. Several, including a few planning their own weddings, could be put out financially in order to attend. On top of that was limited space. To really have the wedding we wanted, we’d have to take a machete to the list. And not giving our single friends a plus-one didn’t seem right. How could we expect someone to travel all the way to romantic Key West for our nuptials and not bring a date? Also unpalatable, however, was the idea of cutting a loved one from the guest list for the unknown arm candy of another. The romantic solution? Elope! But how? I was about to get a crash course. There is no better weapon for budget-slashing in your planning arsenal than eloping. It opens up a universe of exotic travel unaffordable for those planning affairs costing tens of thousands. But narrowing that list down can be challenging. Where to go? Jerusalem? Prague? Bora Bora? We logged hours perusing travel magazines and the Internet looking for something special and off-the-path, but a persistent thought kept rolling around my brain like a pebble in my shoe: My parents. Somehow, the idea of doing it without them seemed … wrong. Eloping is an elastic word. You can stretch the definition to include your heart’s desire. 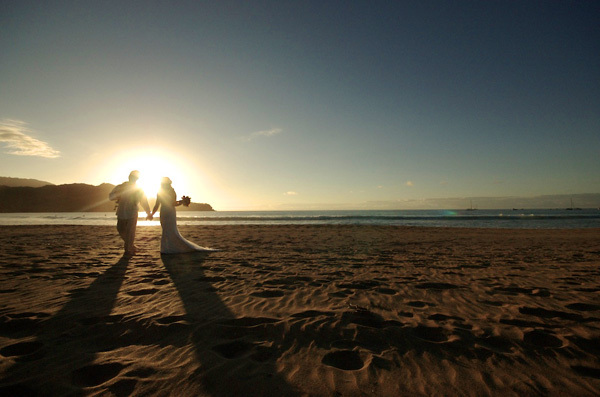 Your nuptial escape doesn’t have to be a solo defection from the conventional. Many couples choose to include parents or siblings, even a maid-of-honor and best man. And so, my parents would come. But I didn’t want them spending thousands and flying tens of hours. Chasing a hot tip from a friend, we discovered – and chose – Harbour Island, a tiny Bahamian blip of geography off the northern tip of Eleuthera, a lithe, languorous island whose name comes from the Greek for “freedom.” Plans were taking shape. Depending on how long your must-have list is and the level of minutiae with which you want to deal, it can be difficult finding a location or venue that can accommodate. Mine were mercifully few, but even so I spent a good deal of time with our resort’s concierge. You’ll likely end up with something of an associate’s degree in local statutes, as well. For example, my ceremony-at-sunset plan was thwarted by a Bahamian rule that marriages must be performed before the sun sinks into the horizon. There are all manner of rules regarding marriage in foreign countries (laws vary from state-to-state, as well – be sure to do thorough research!). Harbour Island is a sandbar of a province, but laws still apply. Amid settling into our wedding-moon in paradise, we had to file all kinds of papers at the registry and meet with the island’s Chief Administrator, who would be performing the ceremony. There’s usually no problem finding local clergy for your wedding, however if you have your heart set on your own pastor, rabbi, qazi or otherwise, he or she may have to share billing with a local minister who can handle the document signing and declare you husband and wife. Through one of the island’s tourism sites I found a local shop owner who doubled as a wedding photographer. We got married on a Tuesday. There is something that still makes me smile about that. The morning was spent lolling on the pink-sand beach, playing amid waves the astonishing color of Blue Curacao. Around 3:30 p.m., my father and I enjoyed a cocktail, and then I went to get ready. The bride wore a $38 dress discovered in a dusty Coconut Grove furniture shop and held a bouquet of magnificent tropicals assembled by the girls at the front desk and tied with an azure silk ribbon. Craig wore a white guayabera and shorts. We were married by Chief Administrator Williams – vows booming over the bluff in his delectable accent – washing over the handful of charmed beachgoers on the silky sand below. Hotel guests applauded. Our eyes sparkled with happy tears. Rum flowed. Copiously. Craig and I spent two glorious weeks in the Bahamas, enjoyed meals in the homes of locals who had become our friends, went scuba diving, ate lobster and drank rum. The entire affair, dress to plane tickets to conch salad, cost under $5,000. Savings is one of the biggest pros of eloping, and with some of what we saved; we took a glorious trip home to New York City and celebrated in style with all of our nearest and dearest in the West Village bar we’d been hanging out in our earliest college days. It was our dream reception. And for our 10th anniversary, perhaps we’ll finally throw that big party – no holds barred.